Outstanding gallery, photography superb . Thanks for the stroll through Vienna, I liked it a lot to see the city through your eyes! Beautiful work of a AN ARTIST! V.
Superb gallery! An impressive work of art! Each composition so well planned and captured! V! A very fine series, full of ideas, and showing well the different facets of this great city. V.
Super gallery, Peter, with colorful and creative images presenting a very different take on Vienna! V.
Wonderful gallery, beautiful compositions, you have a great eye for details !! to show, recreate and even enhance the spirit of a place.. a well known spot, rediscovered through your work. 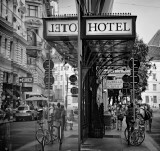 Love these interesting and creative views of Vienna. Your selectivity is very artistic indeed. Great title, Peter. Loving this gallery. A slice of life that is beautifully presented . Excellent captures, really like the processing in these images! You have already captured my attention with this clever title and with these creative and 'selective' snippets of Vienna! ... Wonderful images. I look forward to many more ... Big Vote Already! Splendid start ...Vienna is an enchanting city full of music art and beauty!